2 Electric Utilities Reported Problems Minutes Before Deadly Wildfires Began Both Pacific Gas & Electric and Southern California Edison had warned customers that the companies might need to shut off power because of heightened fire risks. 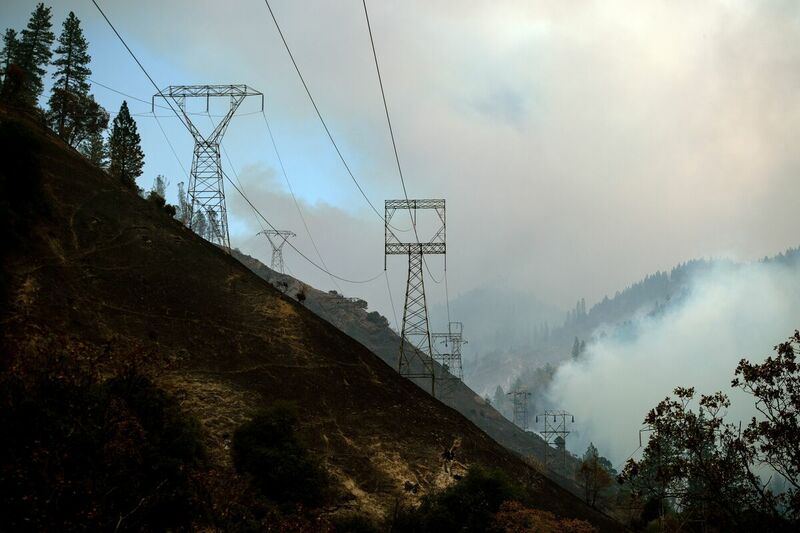 Power lines are seen through smoke from the Camp Fire near Pulga, Calif., on Sunday. Minutes before the deadly Camp and Woolsey fires started in Northern and Southern California on Thursday, utilities reported problems with electricity lines in the same areas where the blazes sprang up, according to filings with the state regulatory commission. Together, the two fires have been blamed for 44 deaths and have consumed more than 200,000 acres of land, as of around midday Tuesday. The Camp fire is now the deadliest wildfire in state history, responsible for at least 42 deaths. The cause of the two fires is still under investigation — and likely will be for months, given the complexity of the cases and the devastation at the scenes. A spokeswoman for the California Public Utilities Commission says it is investigating the blazes in coordination with the state Cal Fire agency, and that it will be taking the two Electric Safety Incident Reports from Thursday into account. California requires utilities to report equipment malfunctions with 24 hours. The first report came from Pacific Gas & Electric, which sent an official notice to the California Public Utilities Commission describing an outage on one of its transmission lines at Pulga Road in Butte County, at 6:15 a.m. local time. For comparison, Cal Fire says the Camp fire began at 6:33 a.m. on Pulga Road. The next report came from Southern California Edison, which said a 16 kV circuit at its Chatsworth substation had relayed at 2:22 p.m., two minutes before Cal Fire says the Woolsey fire started. The utility said the substation is near E Street and Alfa Road in Ventura County — which is also where Cal Fire says the fire began. Before the fires started, both PG&E and SCE had warned customers that dangerous weather — high winds, combined with very dry conditions — could cause power outages; they also also warned that they might be forced to turn off power in parts of their systems because of safety concerns. But neither company took that step to a large extent last week. At least two days before the Pulga Road problem arose, PG&E sent multiple tweets warning customers about what it called a potential public safety power shutoff, saying electrical service "may need to be turned off for safety reasons to about 63,000 customers early Thur, Nov. 8." The possible affected areas included part of Butte, Lake, Napa, Nevada, Placer, Plumas, Sierra, Sonoma, and Yuba counties. But on Thursday, the company opted not to cut power after all, releasing a statement saying, "PG&E has determined that it will not proceed with plans today (Nov. 8) for a Public Safety Power Shutoff in portions of eight Northern California counties, as weather conditions did not warrant this safety measure." When contacted on Tuesday for comment about the decision not to shut off power, PG&E spokesman Jason King said, "we are not able to share more information beyond" what is in its official report. "Nothing is more important than the safety of our customers, employees, contractors and the communities we serve," King said. "Our hearts are with the communities impacted by the Camp Fire. The loss of life and property is staggering. Right now, our entire company is focused on supporting first responders and assisting our customers and communities impacted by the Camp Fire." King added that the information in the incident report to the CPUC is preliminary, saying that PG&E "will fully cooperate with any investigations." He also noted, "The cause of the Camp Fire has not yet been determined." The case is under intense scrutiny, and only in part because the utility has a history of its equipment being blamed for starting wildfires. In addition, the owner of the small town of Pulga, tells The Mercury News that PG&E sent her an email last Wednesday, warning that a nearby tower was "having problems with sparks." SCE issued its own warnings last Tuesday and Wednesday, retweeting a National Weather Service warning of Red Flag status for potential fire risks on Thursday and reminding people to stay away from downed power lines. It followed that with a message highlighting the risk of strong Santa Ana winds across Los Angeles and Ventura counties. In a statement that was updated on Tuesday, SCE said that "about 74,000 customers in high fire risk areas were notified last week of possible power shutoffs in the event extreme winds created a threat to public safety." The utility said that it didn't cut off power to any customers until after 7 p.m. on Thursday, when it shut off electricity to eight customers on Little Tujunga Canyon Road in the Santa Clarita and Sylmar areas, "due to dangerous winds in red flag fire areas." SCE says it "will fully cooperate with any investigations" into the fires in Southern California. And like PG&E, the utility notes that the cause of the fires has not been determined. In an email to NPR, the CPUC says it "will incorporate PG&E's and Edison's incident reports ... into its staff investigations to assess the compliance of electric facilities with applicable rules and regulations in fire impacted areas." It adds that in Cal Fire's investigation will focus on determining how the fires started, and the way they spread. If the timing of the previous investigations is any indication, the state's findings about what sparked the fires may not be reported until at least next spring. It was in May of this year that the first report began to emerge that linked the same two utilities to destructive wildfires in 2017. In June, the California forestry agency blamed 12 wildfires on downed power lines owned by PG&E. Those blazes killed 18 people and resulted in dozens of lawsuits being filed against the large utility. And in October, Southern California Edison said its equipment was at least in part to blame for the Thomas Fire that burned more than 280,000 acres in Ventura and Santa Barbara counties last year. On Wednesday, the California Public Utilities Commission will host a meeting to discuss utilities' wildfire mitigation plans, urging members of the public to attend the session in San Francisco. It's part of a process that was started by SB 901, legislation that requires electric utilities to provide more detail in their plans. Both Pacific Gas and Electric Company and Southern California Edison will participate in the meeting.